A couple of weeks ago, a local media outlet aired a “gotcha” story against Yahweh Center, a non-profit Christian organization that serves children, including some with learning, emotional and behavioral disorders. It seems like a disgruntled former employee wanted her 15 minutes of fame. Yet, I’m concerned what this bad media exposure would do for this center at a time when they’re already struggling due to a decline in charitable giving with the current economic situation. So, I came up with a way that all of us can help. To order your flip flop soaps, go to http://www.sarassoapsnsuch.com/. For more information on the Yahweh Center, check out their website at http://www.yahwehcenter.org/. If you want to find us at the North Carolina Blueberry Festival, we’ll be in booth 72, near the intersection of W. Wilmington Street and S. Walker Street on the Courthouse Square, kind of across from the Pender Rescue Squad. I’ve learned a lot of things from my husband over the years, but one thing which stands out, especially in the current insanity that’s our life together right now, is the importance of working smarter, not harder. For me – and for him – this means finding the right tools which would allow us to maximize efficiency and minimize labor. I’ve recently found two gems that do this for me as I make lip balms. The first is a lip balm filling tray. You can get these at any of several online retailers and wholesalers; I happened to get mine from Bramble Berry when I was ordering a fragrance oil my daughter wanted. It’s a simple concept. You stick up to 50 lip balm tubes in from the bottom, pour your melted lip balm into the tubes, and any mess you make – any spills at all – collect on the top where you can scrape them off, remelt them and repour. The result is the ability to make many lip balms at once with perfect tops and no messy drips down the side. This is a HUGE improvement over pouring 4 at a time, by hand, and having to clean lip balm off the sides of tubes before I could even think about labeling them. The second wondrous addition to my business life are these lip balm labels from Online Labels. I’d heard about them from friends who’d tried them, but I figured, business was in its slow period, so I’d wait. I wish I’d had these five years ago (they weren’t around then)! I bought the clear ones, which look awesome against my white tubes. And ohhhh… They’re large enough to go all the way around the tube with a bit of overlap, meaning they help themselves stay on, plus I don’t have to finangle my font sizes just to get all the FDA-required information on a smaller label. I absolutely love these! 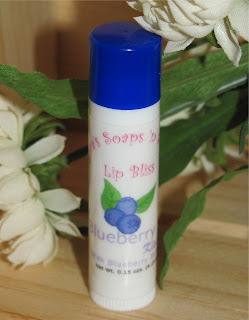 I love the ease of use, the way they print and the great way they make my lip balms look. I save myself a ton of work with these and get consistently fabulous results. The old way? I’d print the label on a smaller white label, then seal it with clear tape. It was a lot of work and a lot of frustration. Check out the picture! Question: What tools make your life easier, especially when it comes to your business or work?